The best UV air purifiers not only trap the bad stuff in your home’s air – they kill it, too! These purifiers use filters to trap particles like dust, pollen, and mold to cleanse the air, then use UV light to kill what the filter traps. We found 10 UV purifier systems we think every home should have! Before we get into the reviews, here are a few features you should consider before buying a new air purifier for your home. 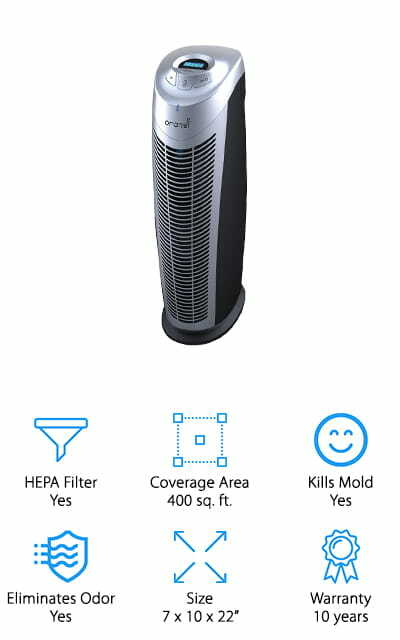 HEPA Filter: A high-efficiency particulate air (HEPA) filter is built to a specific standard to pull 99.97% of small particles from the air. This means it will clean the air of mold spores, pollen, pet dander, and other common allergens or irritants. 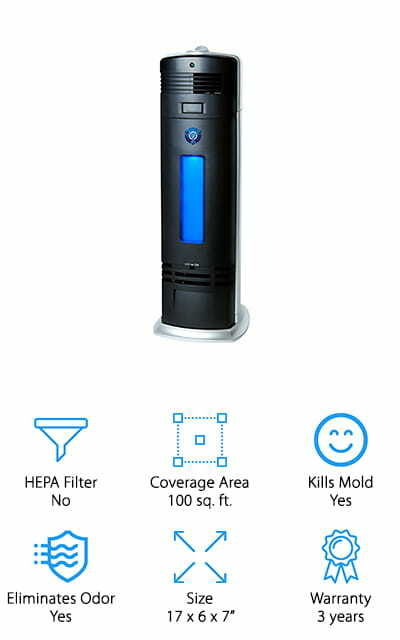 Kills Mold: In addition to trapping mold in the HEPA filter, UV air purifiers use light to kill the mold too! This keeps mold from growing in your machine, and that you won’t expose yourself to dangerous mold while cleaning your machine. Eliminates Odor: Many of the air purifiers we reviewed also have extra filters and features to eliminate odors. This is great if you want to get rid of common household odors like pets, cooking, smoking, or mildew – even your roommate’s dirty laundry! Size: We also noted the size of each purifier, so you can find one to fit your space. Small units are great for bedrooms and dorm rooms. Many of them are also designed to blend into your home’s existing décor, too! Now that you know what type of UV air purifier you need for your home, office, or dorm room, let’s get into the reviews! We found 10 of the best UV air purifiers for sale with a variety of unique features and for just about any budget! If you don’t have time to read about all 10 now, don’t worry! We started with our Top Pick and Budget Pick, so start there and come back when you have more time! First up in our UV air purifier reviews is this hard-working system by GermGuardian! This purifier does a lot to make sure the air you breathe is safe, clean, and smells great! The outer filter traps large particles and pet hair, which helps your machine run more smoothly over time. It’s also coated with activated charcoal to reduce bad odors from smoke, pets, and other irritants. The HEPA filter grabs small particles, such as pollen, mold spores, and pet dander. Finally, the UV-C light kills airborne particles like influenza, mold, and even pneumonia! The light creates titanium dioxide, which helps these bad particles decompose for safe cleaning and storage. It also covers up to 155 square feet, which is great for both large and small rooms in your home! The 6-foot cord is also great for moving around the room where it’s most needed. Overall, this is a workhorse air purifier that will keep your air safe and germ free! Our pick for the best inexpensive air purifier goes to this efficient and environmentally friendly UV air purifier from OION! 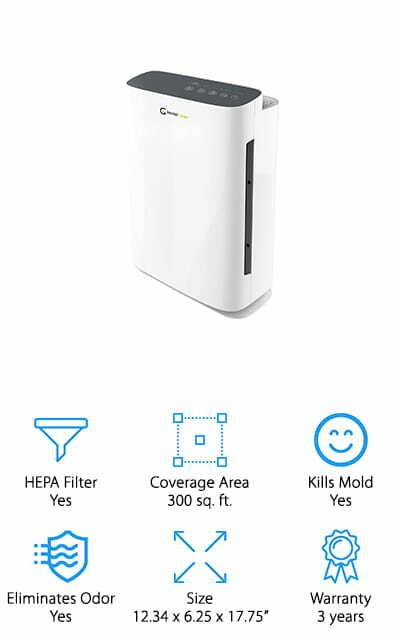 Instead of relying on a HEPA filter you have to replace every few months, it uses an ion filter that you pull out and clean regularly, which saves money over time and is environmentally friendly. The low-energy motor helps reduce your carbon footprint and reduces your energy bills, too! We like that it also uses UV technology to kill the small particles like mold, viruses, and bacteria to keep the air you breathe clean and safe. There is also a carbon filtration layer that reduces odors from pets, smoke, food, and other unpleasant odors. It’s also incredibly quiet, so we think it’s the best budget air filter to put in a baby’s room to keep the air safe without waking them up! This is a solid air filter that will clean the air in your home without breaking your budget! If you’re looking for the best HEPA air filter that also looks great in any room of your home, consider picking up one of these stylish air purifiers from PureZone! We like the overall design of this air purifier because the sleek, white cover looks clean and modern, so it will easily blend into any décor. We also like that it’s relatively small, so it won’t stick out while sitting on the floor or a side table. In addition to looking great, this purifier works hard to keep your air clean and safe. There is an outer filter and carbon filter to grab large particles and reduce odor. 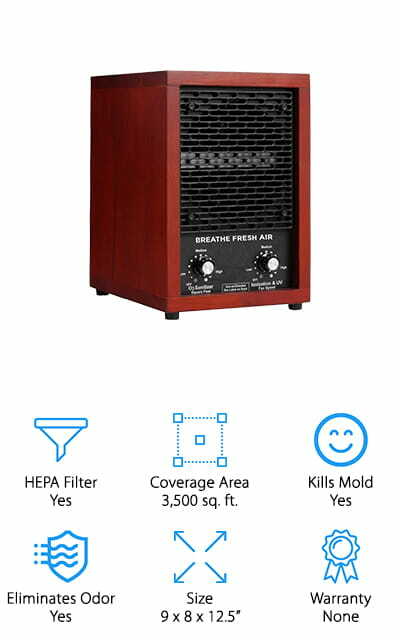 The HEPA filter grabs small particles like dust and mold from the air. Finally, the UV-C light destroys any small particles that could be dangerous to your health, like mold and viruses. Everything is easy to access, clean, and replace, which is great for doing regular maintenance to keep everything running smoothly! If you’re looking to invest in a quality UV air purifier made for large spaces and built to last for years to come, this model from Oransi is a great option! This purifier can cover 400 square feet, so it’s great for large areas like living rooms, basements, and open-concept home layouts! 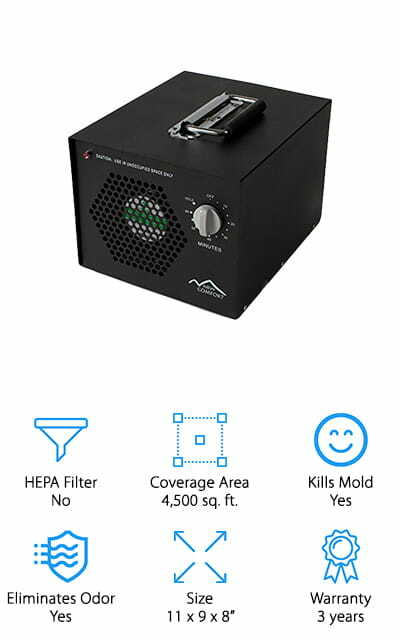 It comes with a carbon pre-filter to trap large particles and reduce odors, a HEPA filter for smaller particles, and a UV light to kill any small airborne pathogens and particles that could make you sick, like mold, bacteria, and viruses. They were even nice enough to give you 2 extra pre-filters, which makes this an even better value – no need to order new ones for a while! We also like that it’s easy to use, with simple controls and a sensor that tells you when the filters need to be replaced. It’s also easy to clean, so you can easily access the filters and vacuum it regularly! We think this unit from SilverOnyx is the best air purifier for basements because it is made especially for large, open spaces! It can reach up to 500 square feet, which is great for large areas like basements. The design is compact, and it’s lightweight, so it’s great for moving around the house as you need it. 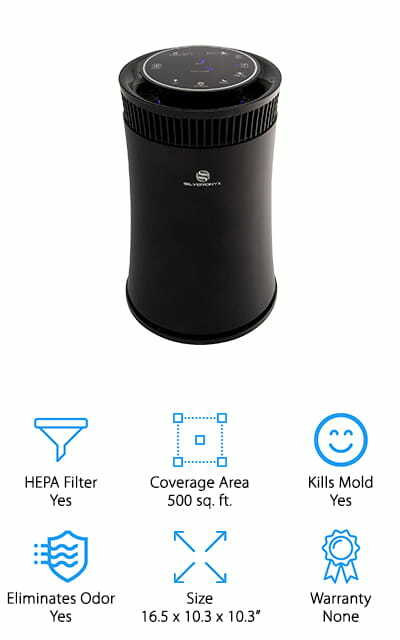 We also like that it has all the filters you need to keep air clean: a pre-filter for large particles and pet hair, a HEPA filter for the small stuff, and a charcoal filter to reduce odors. The UV-C light also helps keep your air safe by killing the particles your purifier traps, making the air safe and keeping you safe during regular maintenance and cleaning. We like that it has several settings, so you can use this however you like! Keep it on low to reduce energy costs, or crank it up while everyone in the house is fighting off the flu! For an air purifier, you can truly set and forget about it, grab one of these sleek and easy to use purifiers from Ivation! The design is sleek and modern, and the white gloss finish will look great in any room. This was one of our favorites for the best UV air purifiers for sale because it keeps your room smelling great! The pre-filter and carbon filter keep large particles and odors at bay, which helps the machine work more efficiently and keeps your home smelling great. The HEPA filter and UV light work hard to trap small particles and kill them, so you can breathe easy! It’s also easy to use, with a touch panel to adjust fan speed, purification level, and a timer that shuts it off automatically after 2, 4, or 8 hours! You can set it and leave the house without worrying about it running all day, or set it to turn off while you’re asleep! Next up in our list of the top ten air purifiers is this compact air purifier from InvisiClean. This is a small purifier that’s great for spaces up to 300 square feet! It uses ion technology to trap dust and particles from the air and sends the air through several filters to clean it. There is a charcoal filter, which reduces odors from pets, smoke, cooking, and other irritants. 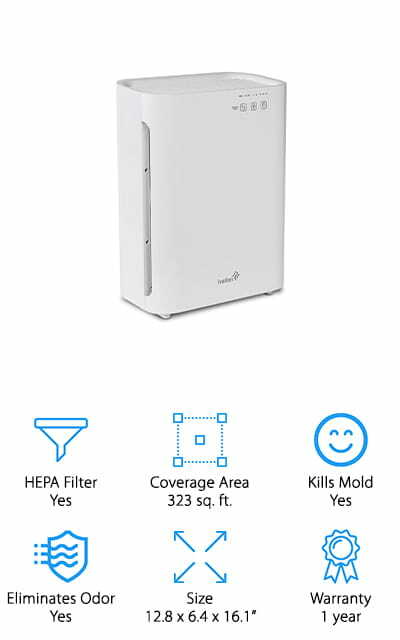 The HEPA filter helps reduce allergy symptoms by trapping common household allergens like pollen, mold spores, dust, and pet dander. For added protection, the UV-C light kills what the filters catch, including viruses, dust mites, mold, and bacteria. This means you can feel safe cleaning your device since it won’t expose you to live diseases or bacteria! We think this is the perfect UV air purifier for your bedroom, a small living room, or office. It would even make a great gift for a college student living in a dorm room! Looking for a commercial-grade air filter to handle truly massive air quality or odor problems? This air purifier from New Comfort is made especially for commercial environments like offices and warehouses. It uses 3 ozone plates to create ozone that can wipe out odors from cigarette smoke, fire damage, paint fumes, cooking smells, mold, and a lot more! It also kills viruses, bacteria, mold, and other irritants to keep your home safe and allergen free! You can adjust how much ozone it puts out by adding or removing the plates easily from the back, and the timer gives you more control over how long the machine runs. We also appreciate that the case is made of steel, which is easy to wipe down and won’t absorb odors over time, even if it sits in extreme conditions. This is a great purifier if you recently moved into an older home that has mold damage, or was inhabited by a heavy smoker. 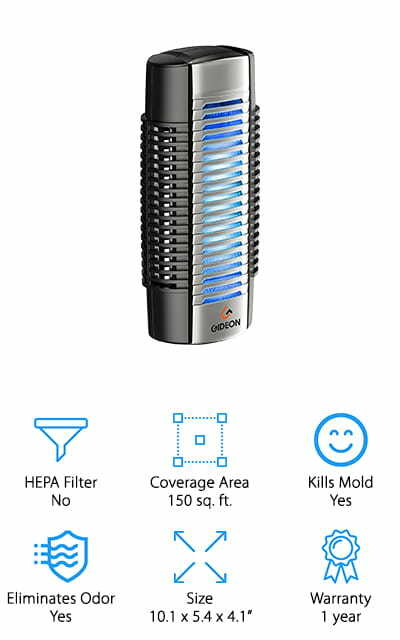 Last up in our UV air purifier buying guide is this small, yet powerful air purifier from Gideon that would be perfect for bathrooms, a small bedroom, or college dorm room. This air purifier is only 8.3 inches tall and plugs directly into a wall outlet to give your space clean air without a bulky unit that takes up precious floor space. Instead of a replaceable air filter, this unit uses stainless steel plates and ion technology to trap particles. This is great for your budget because you just have to clean the plates every so often instead of buying new filters. We also like that it uses UV light to kill whatever the plates trap, including pet dander, mold spores, pollen, and viruses. It will also eliminate mild odors from your room, whether it’s from a pile of dirty laundry or yesterday’s pizza. We think this would make a great graduation gift for a college-bound friend or family member! If you’re looking for the best air purifier for odor elimination, definitely pick up one of these UV and ozone air purifiers from Breathe Fresh! This air purifier is great for large spaces like an open-concept home, workshop, or professional use. 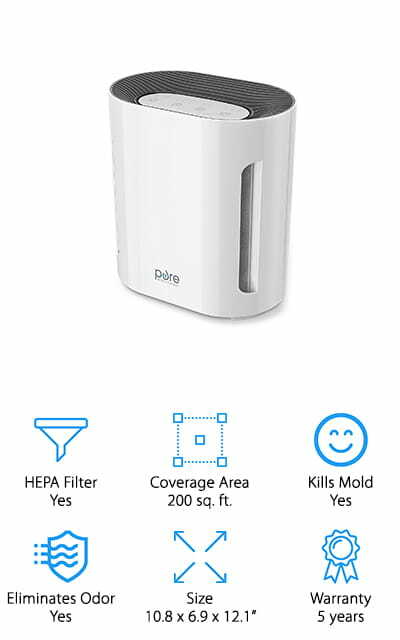 The HEPA filter works hard to clean the air of dust, mold, dander, pollen, and other small particles that can be irritating to people with asthma or allergies. We also like that it has a UV sterilizing light that kills anything the filter picks up, including bacteria, mold, viruses, and dust mites! For serious odor cleaning, this purifier also has an ozone setting that allows you to use this as a professional-grade purifier. It creates ozone that can kill viruses and bacteria, along with killing extreme odors like cigarette smoke, mold, chemicals, and more. If you need an air purifier that can handle some seriously dirty air, this is a great investment to keep your home clean and sanitary!